Tailor made travel insurance, its worth doing right! 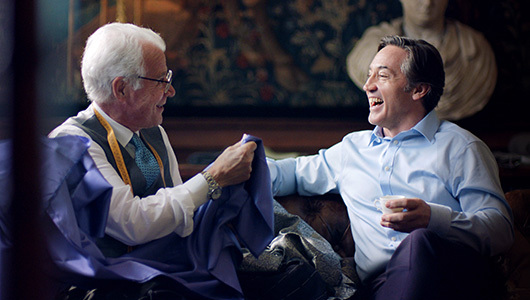 On May 8th 2018 we launched a TV advert as part of our new campaign ‘Worth Doing Right’, which celebrates what we’re really about – providing a tailor-made service, whilst giving our customers the best care and attention they deserve. After all, we believe if something is worth doing, it’s worth doing right! So we asked ourselves – what country is known for its classic tailoring and excellent service based on traditional values? Well, Italy of course! So, with our team and plans in place we jetted off to Rome, ready to put our ideas into action. Shot in a filmic style, our new ad shows our spokesperson, Iain, having a beautiful, bespoke suit made for him; capturing the artistry and skill of creating a one-of-a-kind design – much like our travel insurance policies. 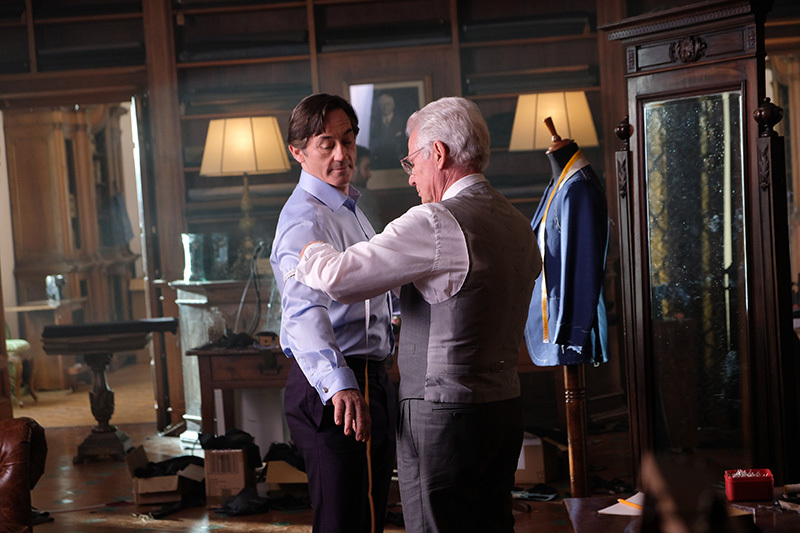 To keep things authentic we used real tailors, headed up by Sicilian-born Armando Rubino, whose fifty years of tailoring experience has been enjoyed by actors, politicians and royalty. For our spokesperson we enlisted the wonderful talents of Scottish actor Robert Cavanah, whose show reel includes various well-known TV medical dramas such as Doctors and Casualty, as well as an appearance in the film Lara Croft Tomb Raider: The Cradle of Life. With the best will in the world and all the months of planning, it didn’t go smoothly at all. With only 1 day planned for the shoot to capture all the scenes it seemed like an impossible task but optimistic and with a very early start to the day we set off to the first location with a spring in our step. The first issue to deal with was due to the fact that we were unable to close the busy, beautiful street of Via Giulia for filming, so the unpredictable Italian city traffic had us frequently hitting pause on the rolling cameras to jump out of the way of speeding Fiats and Vespas! The other problem was the weather… the dull, cold February morning presented us with another challenge from the outset. To overcome this we had no choice but to set up giant lights to try and simulate a warm sunny day in Rome! 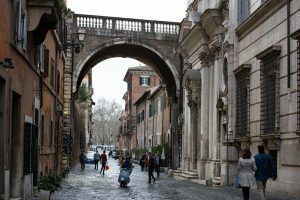 Contrary to what we thought at the time however, it turns out we were in fact rather lucky as the weather was to take a turn for the worst the following week when Rome saw the first heavy snowfall in over twenty years! 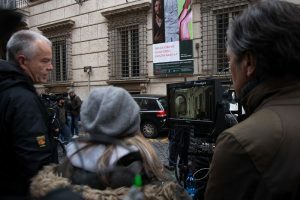 Once we had finished filming in Via Guilia it was time to move back inside and on to our second location – the stunning Villa Vitetti in the south of the city. 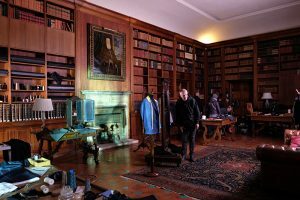 Originally built by Count Leonardo Vitetti in homage to his beloved American wife, the beautiful library was temporarily and cleverly transformed into a replica of Signore Rubino’s own tailor shop to accommodate our 50-strong production crew, actors and extras. As the filming progressed we were blessed to be in such good hands with our team of experts seamlessly pulling each scene together. Using real tailors meant that many of the shots you see in the advert were un-choreographed, which enabled us to capture them carrying out their trade in their own way. The day wrapped up at about 8pm, with everyone more than ready to sample some of the best food and wine Rome has to offer followed by a good night’s rest! We are extremely pleased with our new advert and would love to know what you think too?